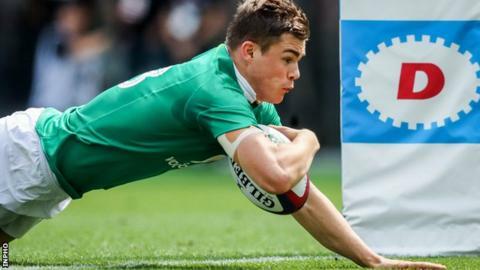 Ireland centre Garry Ringrose will miss next month's three internationals in Dublin because of a shoulder injury. The Leinster player had surgery on the shoulder in July and he is not expected to return in time for the series. Ireland host South Africa in the opening Aviva Stadium game on 11 November and take on Fiji a week later before facing Argentina on 25 November. Leinster coach Leo Cullen said: "Garry is still a bit off so he is probably looking at the end of November." The 22-year-old made his international debut against Canada in last year's November series. Ringrose has impressed in his 11 appearances for Ireland, scoring four tries while also adding a conversion in June's victory over the United States. His absence is a blow for Ireland coach Joe Schmidt, with Ulster centre Jared Payne also yet to feature this season after suffering headaches on the Lions tour of New Zealand in the summer. Ulster pair Luke Marshall and Stuart McCloskey are contenders to fill the void along with Munster's Rory Scannell and Bundee Aki of Connacht.